Here we have one of the two Bristol LS that operated with other than a Gardner engine. Bristol Omnibus Bristol LSA registration UHT 494 fleet number 2884 seen on October 6, 1962 lasted in service until 1968 with an AEC horizontal engine. Much of its in-service time was marked by the engine stalling as drivers who were used to Gardner power were caught unaware of the lower low speed torque! The other non-Gardner was registration UHT 493 fleet number 2883 a Bristol LSTS3 which had a Rootes TS3 diesel which was not particularly reliable and was soon back to a Gardner 5HLW as was the removal of its rear two doors. These two LS were in effect test beds for the engine manufacturers. No. 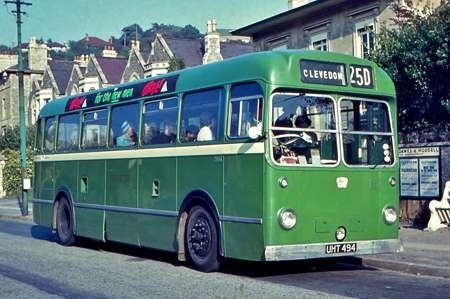 2884 is seen here on the last day of Clevedon town service 25D, which was then incorporated into the main Bristol – Clevedon 25/25A service. It carries the BRISTOL block lettering introduced in the early 1960s. My word, we learn something new every day on this wonderful Forum. I had no idea till now that any Bristol LSs had ever been powered by such unfamiliar units, even experimentally!! This is a surprise to me, too, Chris. Were these engines seriously considered as options for production machines, I wonder? Certainly, the limited output of Gardner units set against the high demand placed constraints upon the sales of several psv and lorry manufacturers. Bristol brought out its own engines to ease the situation, though the BVW doesn’t seem to have been produced in horizontal form. I can see that the AEC unit might have been a realistic option – when running properly it was a good performer – but the wet liner problems might have militated against its adoption in the LS. What engine was it – an AH410 or a 470? I think that Leyland was very reluctant to let anyone else have its engines at that time. I doubt that the TS3 two stroke would have been entirely suitable for the stop/start nature of bus work. Quite apart from the noise, the revs had to be kept high for it to work properly. Most LSs had either a Gardner 5HLW (saloons) or Gardner 6HLW (coaches), or the Bristol 6 cylinder horizontal version of the AVW engine. According to Alan Townsin, the non-standard AEC engine was a 410, as used in some Reliances of the period, and one of the prototypes had a Gardner 4LW, as well as the TS3 engined example. There was a horizontal version of the BVW engine – the BHW. And it was an example – first fitted in an MW used by the BCV works, it was later put into one of the RELH prototypes. The MW later had a Gardner 6HLW engine fitted before delivery to Red and White as a saloon, the RELH gained a Gardner 6HLX before entering service with West Yorkshire Road Car. Don’t forget that there were several Bristol Ks and Ls with AEC engines, so it would not have been unreasonable to offer that manufacturer’s engines in the successor models. Well, this is even more interesting than many others which have delighted us on this forum! Thanks for submitting this, Geoff. I was aware of some Bristol buses with upright engines having AEC products where one might normally expect a Bristol or Gardner power unit, but horizontal ones? And a COMMER? You’ll have to excuse me – I must find a darkened room! Eastern Counties received the second prototype LS, MAH 744, which was powered by a 4HLW engine. Ever economically motivated, ECOC had taken a number of L4G saloons from the late 1930s, and in December 1952, took a couple of production dual purpose LS saloons with the 4HLW engine. These were use initially on express and excursion duties, though the performance must surely have been less than sparkling. Three more appeared in the fleet in May 1953, after which the 5HLW became the chosen Gardner powerplant for subsequent LS deliveries. The LS4G was not delivered to any other Tilling Group company. A number of BET companies specified the AH 410 engine for early AEC Reliance deliveries. The first Reliances bought by Aldershot & District, including the Strachans Everest bodied coaches, were all powered by the AH 410. Despite its modest capacity of 6.754 litres inherited from the 1935 "6.6" A172 (indirect injection) engine from which it was developed, the 98 bhp AH 410 would deliver a creditable road performance. It is extraordinary that AEC, with its significant resources, could never cure the wet liner problems with its 410, 470 and 590 engines. The much smaller Dennis company offered wet liner engines in petrol and diesel form from the mid 1930s, and these were trouble free. I have occasionally wondered how a Dennis O6 powered LS would have performed – the East Kent Lancet UF coaches were fliers and thoroughly reliable, but the idiosyncratic ‘O’ type gearbox was far from easy to use. Perhaps an arrangement between the two might then have permitted Dennis to use the Bristol five speed synchromesh gearbox in the Lancet. End of daydream! The early years of the Bristol LS were certainly interesting. The first two prototypes had aluminium alloy underframes, although production versions were of steel construction. The first prototype (LSX001) entered service with Bristol T&CC, and had a B42D body, and a horizontal version of the Bristol AVW engine. Designated the XWA, the horizontal Bristol engine became the LSW on LS production models. The second (LSX002) was powered by a Gardner 4HLW engine, and perhaps not too surprisingly was supplied to Eastern Counties. Bristol T&CC 2883 mentioned by Geoff was built in 1953 with an unfinished bodyshell, painted grey and used by Bristol for development work. It received a Commer TS3 two-stroke Diesel engine and was given the chassis designation LSTS3. It eventually entered service in the Bristol T&CC fleet as 2883(UHT493) in 1955 to B43D specification, but was fitted with a Gardner 5HLW engine in 1956. The LS6A (2884) shown in Geoff’s photo was also built in 1953, and similarly sported a grey-painted unfinished bodyshell, again used for development work. The engine chosen was AEC’s 6.75 litre AH410 unit (as offered in AEC’s Reliance and Monocaoch models), together with an AEC 5-speed gearbox. Like 2883, 2884 entered Bristol T&CC service in 1955, in this case to B45F configuration. Roger, I cannot think why Bristol chose the TS3 engine (aka ‘The Knocker’) as an experiment, as it was not really that popular in the wider bus world, although it did sound gorgeous, if a bit raucous, in Commer lorries. Maybe they saw potential for it powering lightweight buses such as the LS, due to the engine’s good power to weight ratio. The early TS3s developed 105bhp @ 2400rpm from only 3.26 litres, which was amazing at the time. The choice of an AEC engine and gearbox though could perhaps have been an attempt to woo London Transport. 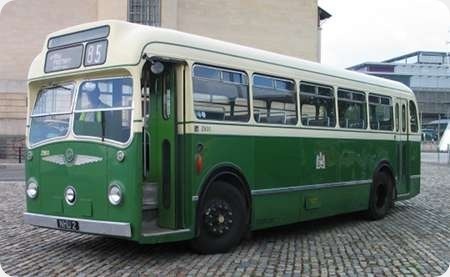 LTE had tried an early Bristol LS5G bus (Bristol T&CC 2828:PHW918 painted in Green Line livery), which must have been something of a culture shock to LT drivers used to buses with 6-cylinder engines, fluid flywheels and pre-selector gearboxes! It is perhaps not surprising that the LS5G was not popular with LT, so Bristol then fitted it with a Hobbs semi-automatic transmission. The LS5G returned to LT for around six months, but no orders followed, and on returning to Bristol 2828 was fitted with a standard Bristol gearbox. All fascinating stuff. It’s just a shame that most of us never had the opportunity of hearing the wonderous sound effects of an AH410 or TS3-engined LS, or for that matter, a semi-auto LS5G. I am surprised to see that this bus has a "normal" destination display; Bristol Omnibus LSs (and other types) normally had a single blind showing destination, number and via points. The fairly common T-style display was adopted with the later MWs and F-series Lodekkas, although even then the display was non-standard because there were four service number tracks. 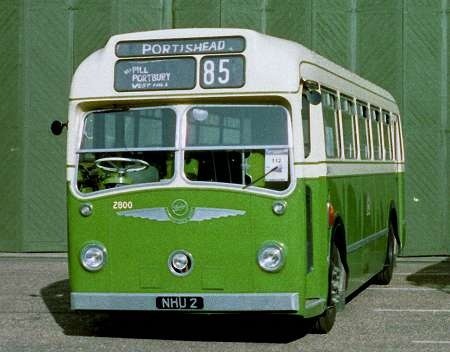 The recent book by Martin Curtis and Mike Walker on BOC – The Green Years – includes details of the two LS buses 2883 and 2884 which had been used by ECW for body development and passed to the company in 1955. 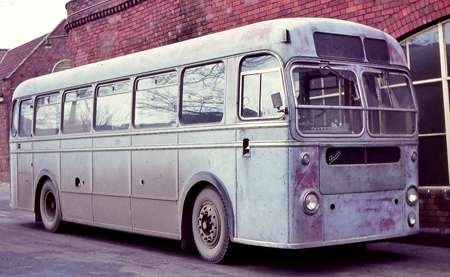 The former previously used as an unfinished shell had the standard company destination display fitted with the Commer engine soon replaced by a Gardner 5HLW.The latter retained its AEC engine throughout its life and was unique with the company for its "side by side" destination favoured by other NBC companies such as the adjoining Wilts and Dorset – apparently the body had been used by ECW in connection with the development of the Bristol SC which had of course a similar destination display. In 1967 it was also fitted with an MW-style grill – and lasted until 1968. There is a black and white photo of 2884 in the book seen leaving Marlborough St bus station on the 25B to Nailsea. A second depot photo by Peter Davey shows the grill fitted – most odd -by which time the destination blind had been reduced to a single line by masking tape. This is the first time I have seen a colour picture of 2884. Thanks. There is a dedicated posting for the two LS prototypes elsewhere on OBP (see link below), but I’m sure no one will mind me adding a picture here of NHU 2 taken at Duxford a few years ago. I would imagine that the attraction of the Commer TS3 would be its legendary fuel economy. If they’d put it into a coach instead of a bus, it might even have worked! The TS3 two stroke was used in coaches – Beadle and Harrington both offered coach models with this engine. 476 BEV was delivered new in 1955 as an LS5G but was soon converted by ENOC to the above, presumably as a comparative trial. It was converted back to LS5G in 1960 and spent another six years with the company before being sold to Hedingham & District where it saw out its last few years. So far as I was aware this chassis was coded LS6A, perhaps my original text was faulty! What a fascinating lot more information this has stirred up. I mentioned the horizontal BVW in my article on the Bristol RE. I was unaware that it had been used in an MW before that – but I bet it wasn’t turbo-charged at that time! This photo probably shows the test bed, a rather bedraggled looking ‘experimental’ MW taken at BCV on March 3, 1963. The 2884 destination layout looks much nicer to me than the other standards used by BTCC & BOC: the 18 in. high single aperture and the destination above route number display. There was a nice batch of vehicles with the intermediate 12 in. high single aperture display that looked just as pleasant to me as 2884. Thanks for further information about BOC displays on my 1963 MW5G submission, but I’m sure I saw W in use when the suffix letters were first introduced! There is (was?) a full page explanation of the short workings in the front of the Bristol Joint Services timetable for 1965. The introduction states that ‘The number of buses which carry destination equipment capable of showing numbers and letters together is being gradually increased’ – in other words, the replacement of single piece blinds by 4-track ‘T’ indicators. Exactly why a single piece display cannot show (e.g.) 9A instead of 9 for the Ashton Gate short working passes me by I’m afraid. Surely you just print the blind with 9A on it. The 4-tracks were a bit of overkill in some ways when you consider that the entire city fleet was being fitted with these displays when there were few workings which required them – 145A Henleaze Lake short working, the 236A extension to Brislington Trading Estate and journeys on 142,236 or 282 extended to Rodney Works, Patchway Bus Park or Shadow Factory were the only ones which actually needed all 4 tracks. This Bristol LSX5G with chassis number LSX.001 was new to Bristol Tramways in 1950 and has an Eastern Coachworks B42D body numbered 4978. It was, as its chassis number suggests, a prototype. Seen here at the Bristol Waterfront Running Day 22/05/2011. Nice, Les! Another for me to delete from my list of possible future submissions . . . This image is scanned from my original print so not great, however it is a piece of history. The two prototypes were together for the first time in 54 years here at Showbus 2005. 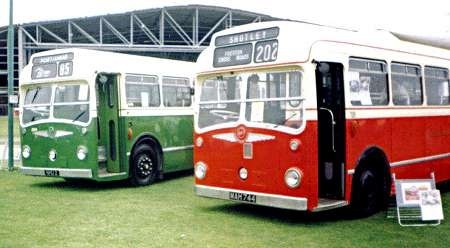 The red one is Eastern Counties LL744 and registered MAH 744 with chassis number LSX002 and Eastern Coachworks B42F body 4255. Not a great shot but I thought it worth sharing. I hadn’t realised until I saw the LS at this angle just how American are the lines of this bus enhanced perhaps by the rear doors. Orla, just seen this and my thoughts were exactly the same. They would not looked out of place in any US city in the 50s and 60s. You can find the same in cars of that era. It’s really the front end with the decorative bits and anti-glare windscreen that does it- but what is the central light for? A foglight was at a lower level, usually nearside, illuminating the kerb. This is higher on (2) and in the middle? I think that it was a fashionable idiosyncrasy at the time. Think of contemporary cars like the then Rover 75 and Austin A90 Atlantic. They never really caught on and eventually were phased out by Rover and the A90, though very eye catching, didn’t appeal to either the UK or American market (where the 1948 Tucker ‘car of the future’ was similarly equipped). Similarly in France the early ’50’s Panhard Dyna had a central oblong foglight in the bumper but these too were designed out on later models (pretty impractical anyway given French street parking practices!). Nice photos Les, and its lovely to see the two LS prototypes together again as you say. They are both interesting vehicles in their own right. The ‘Bristol Bristol’ (LSX001) was originally powered by an experimental horizontal version of the Bristol AVW engine – this experimental power unit being designated XWA, with the production version becoming the LSW. 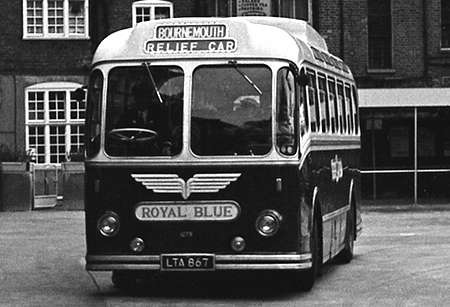 A Gardner 5HLW engine was fitted in 1953, along with 8ft wide axles in lieu of the original 7ft-6" ones, and the bus was converted to single-door layout in 1956. (It’s great to see that LSX001 has been restored to original B42D configuration, which must have involved a fair bit of time, effort and money to say the least, and it is a credit to everyone concerned). Relating to the Eastern Counties Bristol (LSX002), this vehicle was fitted with a Gardner 4HLW engine from new. Generally LS vehicles were powered by either Bristol LSW, or Gardner 5HLW/6HLW engines, but ECOC did take delivery of further LS4Gs, but I believe this was a small batch of five vehicles. Both prototypes had aluminium alloy underframes, to reduce weight, but production LS underframes were of pressed steel, which was easier to weld and was less expensive. 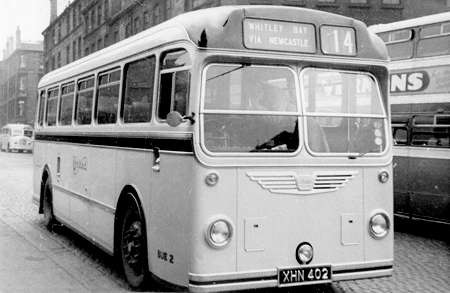 Despite the use of a steel underframe however, the LS in bus form with Gardner 5HLW engine tipped the scales at around 6.25 tons, which is very creditable. Economy was also good, with Southern and Western National’s LS5G buses apparently averaging 15mpg on country services – aided no doubt by 5-speed overdrive gearboxes. The memory is probably going, but I think I recall Bristol LS coaches prior to the introduction of the MW. These had deeper windscreens with rounded corners and I always thought them to be a prettier body. I’m remembering back to Southampton coach station in the 1960’s(that milk machine had the best strawberry milk on the South Coast! )and I am sure that Royal Blue, Southern National & possibly Hants & Dorset examples used to visit there. Do we have any photos? The handsome early style of ECW coach body for the Bristol LS that David describes appeared in 1952. Royal Blue had a batch of fourteen of this type delivered in that year with C41F bodywork (though the LS was an integral vehicle, of course). They were all reseated to C39F in 1960. Here is LTA 867, fleet number 1279, leaving Victoria Coach Station for Bournemouth in the summer of 1961. Roger, would this particular version of the LS coach body be the one where the front windscreens wound down into the dash panel? There doesn’t appear to be any other method of opening and I believe it was still a requirement at the time that the drivers windscreen, at least, should have the capability. I imagine it wouldn’t be possible to wind them down to a point where the wipers could become trapped on the inside of the glass! Yes, the LS coach windscreens do wind down into the dash panel. Those who admire this style of Royal Blue coachwork may like to note that one of this style is expected on the 2016 Royal Blue run – details at http://www.tvagwot.org.uk/event-royalblue.htm. That style only applied to the 1952 built LS coaches – those built from 1953 onwards having the windscreens made of two flat sections, the upper one being hinged at the top, in the same way as the first style of MW coach body. Yes windows wind part way down. One of the batch took part in this years London-Brighton run MOD 973 I think. They must have been the biggest panes of glass ever to have been wound down (and up) – pretty heavy, I would guess. And one of the very few (perhaps only) winding windows to have windscreen wipers, too. Waiting in Glasgow, exact location unknown, BUE2 is being prepared for departure on the service 14 (later 515) to Whitley Bay. The service ran once a day in winter, and twice a day in summer months. It was a long drawn out affair with a total running time of about 9 hours. A joint operation between SMT and United, vehicles from either end of the route would meet at Galashiels where a refreshment stop was taken, the crews would then swap vehicles and return to their own depot, the vehicles would carry on and return the following day. An Express service also operated via a shorter route, the running time on that was about 5 hours, and generally, the crews worked the whole route returning the same day. The location looks like Port Dundas Rd once the terminus for many long distance services to Glasgow. Is that and ECW bodied Daimler owned by Alexanders at the top left hand corner of the picture and an S.M.T. A.E.C Regent to the right of the picture? These were beautiful vehicles, good looking, great livery (an example here) and comfortable seats. They also looked good in later life in red livery. The only disappointment was that to me the sound of the Bristol engine never seemed right in an LS, the majority having Gardner engines, which sounded wonderful.